Olympic size pool cleaning done with a compact durable design. Its Dual Pump Motors and large body design provide the necessary filtration and cleaning capability for pools over 80 feet long. A new body and drive-train design focused on maximum durability, quicker cleaning and agility. Factory programmed to automatically vacuum and scrub the pool floor with onboard Brushes, self-contained Filter Bag, Pumps and Drive Motors. Radio Remote Control with Dual-direction button for K-Turn spot cleaning. Left and Right buttons adjust cleaning pattern for pool’s width. Program button activates a wall-cleaning pattern or adds a 1 hour cleaning cycle delay. Stay-Cool Power Supply with low voltage transformer and Digital Display to adjust the cycle for 1-7 hours or Continuous Run to meet cleaning needs. 2 year warranty. 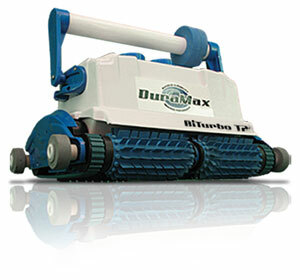 DuraMAX Biturbo T2 - Weighs 33 lbs / 120’ Cable / ETL certified. Stay-Cool Power Supply- 3-Pin Female Socket / ON/OFF switch / Digital Display Low Voltage / 3-prong plug for standard 110 Volt GFI outlet / ETL certified. UltraKart Jr.- Durable caddy for easily transporting the cleaner and its equipment. Radio Remote Control- 4 Button remote control: FORWARD / BACKWARD button for K-Turn. PROGRAM button for 1 hour Delay or Wall-cleaning mode. LEFT and RIGHT buttons set the cleaning pattern for smaller or larger pool widths. DeepClean™ Super Brushes- designed for any pool surface, even smooth surfaces like Tile, Vinyl, Fiberglass, Steel, Epoxy or Painted concrete. Beach Boy Air Sensor - Detects Zero-Depth water level like Beach Entry pools. InfraRed Sensor- Detects obstacles or walls standing 5 inches or less from floor. Raised InfraRed Sensor - Detects obstacles, like hanging bulkheads, that rest 13 inches or less over the pool floor. Gallons / Liters Per Min. Operating Voltage @ 60 cyc.